SCVHistory.com GA1000 | Film-Arts | Gene Autry, Singing Cowboy. Orvon Gene Autry was born on a ranch outside Tioga, Texas on September 29, 1907. He went to work for the St. Louis and San Francisco Railroad after high school and learned the telegraphing business. In 1928 he landed a singing job with a local radio station, and within three years he had his own radio show and made his first recordings. Autry's acting debut came in 1931 in Ken Maynard's In Old Santa Fe. The following year he starred in a 13-part serial, Phantom Empire, and signed a contract with Republic Pictures. Many of his early films were shot on location at Ernie Hickson's Monogram movie ranch in Placerita Canyon, at the intersection of Oak Creek and Placerita Canyon Road. His films often grossed ten times their $50,000 production costs. From 1942 to 1946, Autry served his country as a flight officer with the Air Transport command. Upon his return he signed with Columbia Pictures and soon formed his own production company, Flying 'A' Pictures. In the 1950s he produced several hit TV series including The Gene Autry Show, Annie Oakley and The Adventures of Champion. 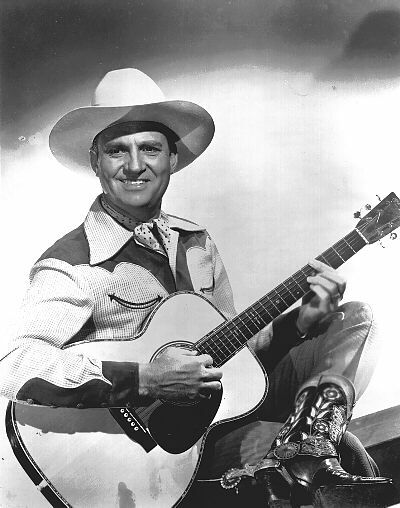 Nicknamed the "Singing Cowboy," Autry wrote over 200 songs including the ever-popular Rudolph the Red-Nosed Reindeer (1949). He retired from acting in the 1960s and focused his attention on his investments  particularly his beloved California Angels baseball team. Back in 1952, upon the death of movie ranch owner Ernie Hickson, Autry decided to purchase his old Placerita Canyon stomping grounds. Renamed "Melody Ranch," the authentic Western town was used in the production of numerous feature films and television series including Gunsmoke, which became the longest-running TV show in history when it finally ceased production after 22 years. On August 28, 1962, a violent firestorm swept through Placerita Canyon and engulfed most of the old Western structures at Melody Ranch. In the decades that followed, Autry and his business manager  wife Jackie  sold off parts of the 110-acre ranch and put the final ten acres, where the buildings had stood, on the market in November 1990. Brothers Renaud and Andre Veluzat, longtime Newhall residents, quickly purchased the parcel and restored the Western movie ranch to its former glory in 1991. Further reading: "Memories of the Place I Called 'Melody Ranch'" by Gene Autry.